The Hand-Written Life Holiday Card Exchange 2013! 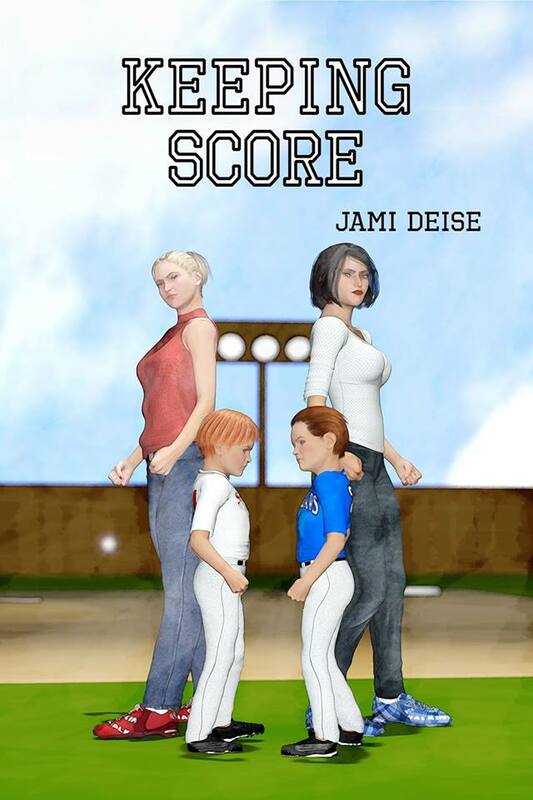 Today I have the pleasure of introducing you to Jami Deise, the author of the hit “mom-lit” baseball novel, Keeping Score. The story follows main character Shannon Stevens – a single mother doing her best to support her growing son, Sam, while struggling with the realization that growing up means growing away from her, and her ability to protect him from the challenges life is bound to throw his way . When her son Sam asks to try out for a travel baseball team, divorced mom Shannon Stevens thinks it’ll be a fun and active way to spend the summer. Boy, is she wrong! From the very first practice, Shannon and Sam get sucked into a mad world of rigged try-outs, professional coaches, and personal hitting instructors. But it’s the crazy, competitive parents who really make Shannon’s life miserable . . . And the action off the field is just as hot. Shannon finds herself falling for the Saints’ coach, Kevin. But how can she date a man who didn’t think her son was good enough for his team…especially when the whole baseball world is gossiping about them? . . . As Sam works to make friends, win games and become a better baseball player, Shannon struggles not to become one of those crazy baseball parents herself. In this world, it’s not about whether you win, lose, or how you play the game…it’s all about KEEPING SCORE. This hilarious novel has reached several highs on Amazon’s best seller lists, topping at #6 on Women’s Humorous Fiction and #10 on General Humorous Fiction – as well as #13 on Barnes & Noble’s Humorous Fiction best seller list. And between now and November 27th, you can pick up a copy for your Kindle, for only $0.99! But first, check out the interview below, where I talk with Jami about her own personal experiences as a baseball mom, the challenges authors face these days, and what this new genre “mom-lit” is really all about! 1. What initially drew you to writing? Loving books, I guess. I’ve always been a reader and a writer. The first writing I did was “Little House on the Prairie” fan fiction when I was in the 2nd grade. 2. I understand your son plays baseball – did any of your own experiences as a baseball mom while he was growing up inspire you when it came to writing Keeping Score? Did you include any specific experiences in the book? Yes, they did! There are a few specific experiences (and lines of dialogue) that were inspired from real events. I’m happy to say the most egregious stuff is straight from my imagination, though. 3. Did you model the main character Shannon’s son, Sam, after your son at all? How does he feel about the book – does he think it’s cool that he helped inspire it, or that his mom is an author? Well, my son is a left-handed pitcher, so… yes, definitely. Personality-wise, they aren’t alike but he and Sam faced a lot of the same struggles. As for the coolness factor – well, he’s still a teenager and I don’t think anything I do would be considered cool by him. I’m just glad he’s not embarrassed. 4. What was the biggest challenge you faced during the writing process? 5. How have things changed for you since becoming a published author? What has the best experience been so far? When I meet other baseball parents, I now put my book in their hands and ask them to please read it! I think the best experience was opening up that box and seeing my book – a real actual book with pages and a cover and everything. I also recently spoke at a book club that read it, and that was a really neat experience, too. 6. Have you been surprised by the positive responses you’ve gotten to the book? No. Just the negative ones. LOL! ☺ I was hoping that KEEPING SCORE would strike a nerve not just for baseball parents, but all parents who are sick of all the competition their children have to go through – sports, academics, college applications – it’s just so brutal! 7. Even though success means much more than just the numbers, it still must be exciting to have something so person receive such positive feedback – how do you feel when you see Keeping Score doing well on book lists? It is very, very gratifying. Not only do I want the book to reach as many people as possible, I also want to have a reason to keep writing, and when I see KEEPING SCORE on these lists, I feel like I have one. 8. What are your thoughts on the new genre of “mom-lit,” for books with storylines centered around moms and their kids? I love it! So many women’s fiction novels end with the proposal or the wedding, and life changes enormously when women become mothers. Priorities change. There’s mom lit with new mothers dealing with tiny babies, and then there’s mom lit dealing with the older ones. Hmm, maybe we should split the genre even further. There’s a saying parents have: “Little kids, little problems; big kids; big problems,” which is why I think that mom lit centered around older kids offers more opportunities as far as plot is concerned. 9. You are currently working on a second book in a totally different genre than “Keeping Score” – and this one is about vampires, correct? What is it like writing for two such different genres? Is it difficult? Yes, it’s about vampires… but … it’s about a mom who happens to be a vampire assassin, and the vampires have kidnapped her daughter. So that thread about being a mom and wanting to protect your child more than anything is still there. My voice is much different in this one, though. The stakes are much higher and there’s not a lot of humor. It wasn’t difficult, but if I’d attempted to write both books at the same time, I don’t think I would have finished either project. 10. In addition to your new book, what else can we look forward to seeing from you in the future? Do you have plans for more writing? Yes, I recently finished the first draft of a women’s fiction novel about a working wife/mother who loses her job just as her husband gets the job of his dreams. The catch: she’s a lobbyist for Democrats and his new job is on a right-wing TV station. It’s still very much in first draft stage, so it’ll be a while, but it’s funny and I’ve had fun with it. Before I sign off, I just want to say a big thank you to Jami for taking the time to chat with us about her book, and I hope you all enjoyed it as well! !